A roomier version from the signature LadyLike collection that combines beauty with incredibly practical features. 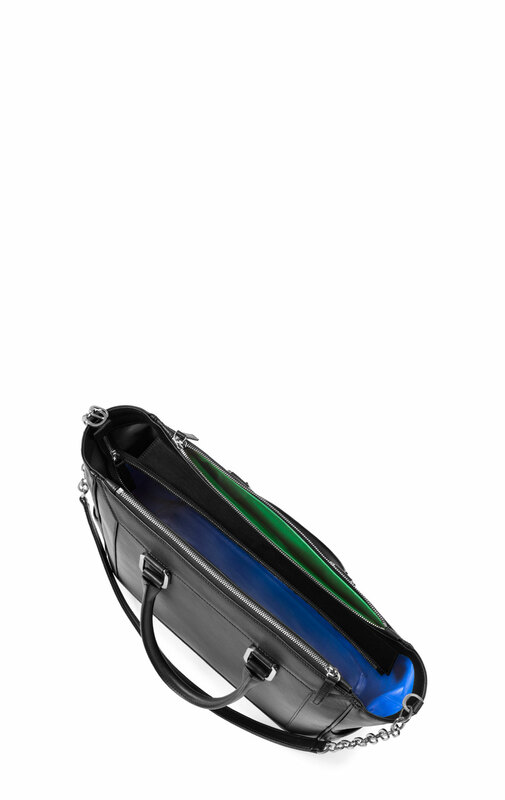 This LadyLike M boasts a smooth onyx calfskin. Flaunting an even more spacious interior, this style is perfect to carry work documents or weekend items. Featuring a magnetic flap closure and equipped with large side pockets to make sure all of your favorite things are zipped away. Attach the convenient leather and chain strap to wear on the shoulder or cross body for the woman on-the-go. Large interior compartment with two smart-phone pockets and internal zip pocket. Exterior lined with two large zip pockets and two small exterior compartments on each end.